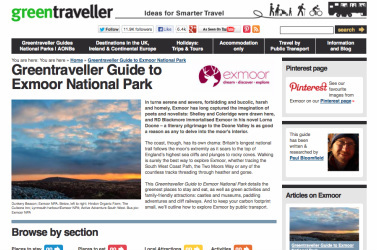 I've written guides to Exmoor, Dartmoor, the North York Moors, the Cairngorms, ﻿Normandy﻿, Catalonia and Las Alpujarras in Andalucia, including several inspirational features on hiking the Coleridge Way, kayaking the Ebro river, Exmoor's native ponies, fossicking for food and fossils on a shore safari in Staithes, and watching Andalucian wildlife. My online articles for Lonely Planet cover the world's most amazing waterfalls, wet and wild activities in Malaysia, the essence of London and countless more. Quirky travel features on London's Tin Pan Alley, the capital in 24 hours and many more. Blogs for various websites and clients, including a recent piece on tracking bears in Slovakia and another on walking (and cheese) in Switzerland. Incisive and lively copy on pretty much every destination on the planet. Looking for sparky, sticky, well-written web content? Contact me to chat about blogs, features, lists and other traffic-magnetic online copy.